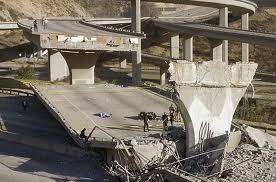 On the 17th January 1994 a huge earthquake has rocked Los Angeles, killing 60 people. The earthquake, which measured 6.6 on the Richter scale and lasted for 40 seconds, struck at 0431 local time (1231 GMT). The number of injured was 7,707 and more than 5,000 buildings were deemed to be unsafe. Repairing the damage to the city cost around $30 billion. The earthquake was felt as far south as San Diego 200km away and as far north as Las Vegas, 440km to the north east. The airport has been closed due to a lack of power and doctors are having to perform surgery in the open air because hospital buildings are severely damaged.